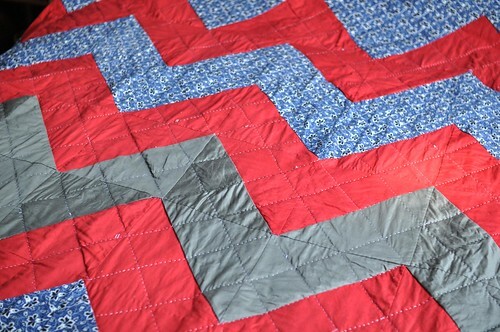 The Chevron Quilt is done and loved! 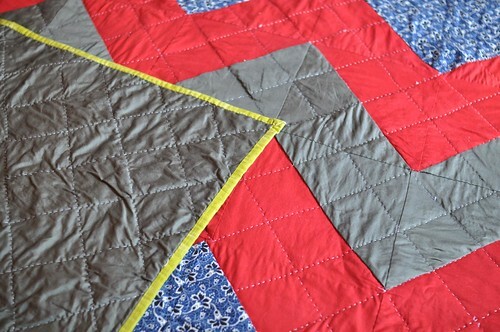 The half square triangles started out as 10″ squares, which I sewed in pairs. Both fabrics for the top were from KickAss County Store, the backing is an Ikea duvet cover piece, and the binding is Painters Canvas by Laura Gunn. I learned a ton by making this quilt, which is pretty much just my second one! I hand pieced and hand quilted the whole thing, which I’m quite proud of. 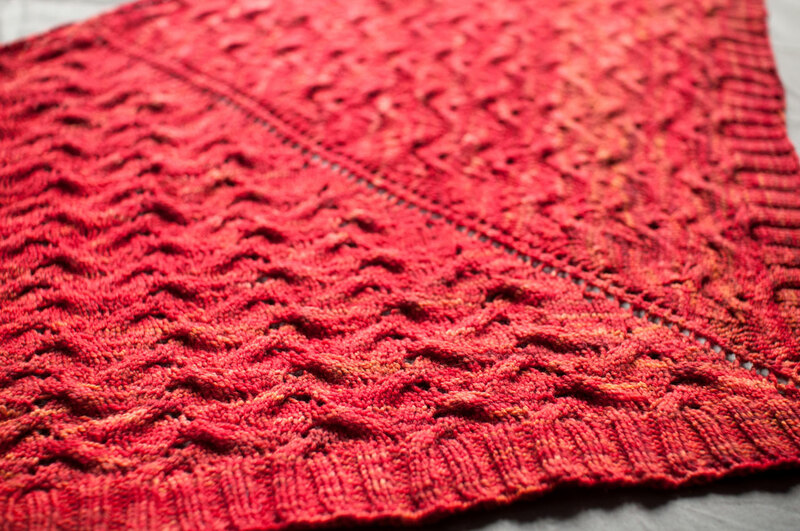 The points don’t perfectly match, there are some creases in the backing, and there were a few spots in the binding that needed attention after washing, but overall I’m very happy with it! It’s been on the bed for awhile already. I didn’t grow up with quilts, mostly comforters and duvets, so the feel of a quilt is a revelation. 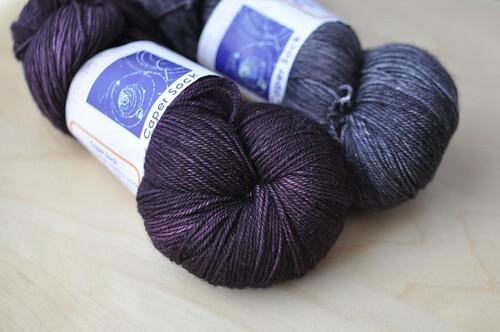 It’s light yet warm, thin but nicely dense and weighty. I love it. We were on vacation this past week, and took a little road trip up to St Jacobs. 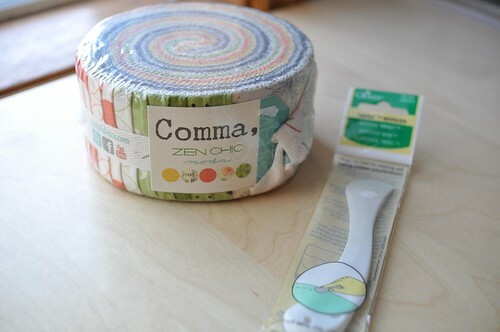 The weather was lovely, and I ended up with a few souvenirs – this Comma jelly roll and Clover Hera marker from Reichard’s quilt shop, and some lovely String Theory sock yarn from Shall We Knit? in Waterloo. Thanks ladies! It’s gorgeous, Laura! 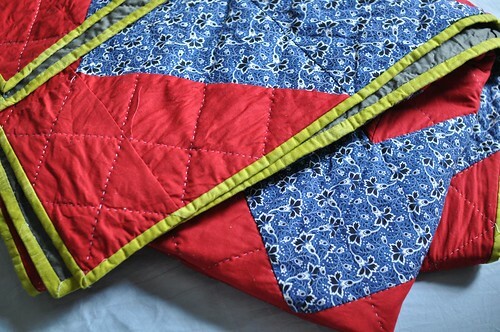 I love that you hand stitched and hand quilted everything, it makes me want to stick with my own handwork projects. 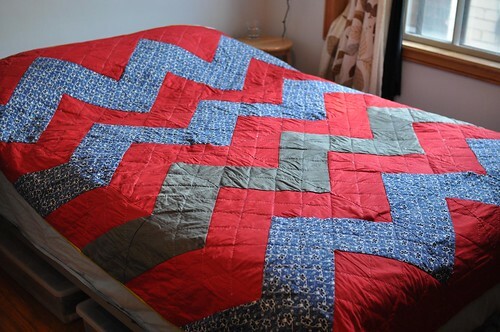 Congratulations on your second finished quilt. That is incredible!!! Excellent work. I love the lime trim.